Designed and created by Joseph Asscher in 1902, the Asscher cut diamond is often found in vintage jewelry. Vintage Asscher cut engagement rings highlight the beauty and elegance of Art Deco style diamond cuts. The corners of this diamond are cut in a dramatic fashion that lends a distinct look to the stone. Since they have a very appealing and unique sense of style, Asscher cut diamond engagement rings are both rare and appealing to many young brides today. The Asscher Cut has become one of the most recognizable of all diamond cuts, but what exactly is an “Asscher” cut? In short, an Asscher cut is just a square emerald cut. Asscher cut diamonds are recognizable by their large, wide-set facets, making the stone octagonal in shape. Some jewelers refer to Asscher cuts as the “square-emerald cut”. Typical vintage Asscher cut engagement rings include diamonds with wide windmill type reflections, deep pavilions, wide cut corners, small tables, or high crowns. Due to their step-like cuts, Asscher cut diamonds will display more inclusions than round diamonds. Similar to the emerald cut, an SI clarity Asscher cut will expose more inclusions than another antique diamond. When looking for a quality Asscher cut diamond, it’s recommended to start with a VS2 clarity or higher. The Asscher cut diamond is identified by its 58 larger step facets, smaller table, and higher crown. The clarity of an Asscher cut diamond is what truly sets it apart. Unlike brilliant cuts, Asscher cuts do not have that excessive amount of sparkle and brilliance. The Asscher Cut itself was patented, upon the design first being revealed in 1902 by The Asscher Diamond Company in Amsterdam, Holland. Due to Jewish persecution, the Asscher family had their business and store of diamonds seized during World War 2. The patent was never renewed. The lack of patents led to many companies utilizing the square-emerald cut design of the original Asscher cut. 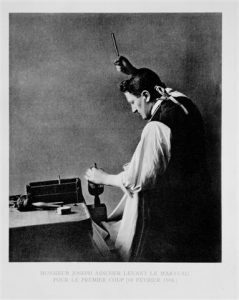 Joseph Asscher was already a world-renowned diamond expert when the Cullinan Diamond was discovered in South Africa in 1905. The diamond was presented to King Edward VII of England, who commissioned The Asscher company to cleave the huge 3,106 carat stone. The resulting cut stones, nominally named Cullinan I to Cullinan IX are all owned by the British Royal Family, with the two largest stones forming part of the British Crown Jewels. The Cullinan II is one of the most famous cushion cut diamonds ever created. In recent years, the Asscher Cut has become synonymous with celebrity romance, with the cut being a feature of several very high-profile vintage engagement rings. This association with fame and celebrity isn’t new. It has been popular since its inception. As of 2000, the Asscher cut diamond is one of the most popular diamonds on the market, with its popularity growing with each passing year. The first diamond bought by Richard Burton for Elizabeth Taylor was the 33.19 carat Krupp Diamond, with an Asscher Cut believed to date from earlier than 1920, and therefore would have been one of the earlier Asscher Cuts to be identified. Bought by Taylor for the price of $307,000, the Krupp Diamond has since been determined to be of exceptional quality. Graded by the GIA as D color and VS1 Clarity. This diamond also has information indicating that the stone is likely to be internally flawless, such diamonds, classed as Type IIa, are extremely rare. She considered the Krupp Diamond as one of her favorite pieces, and often wore it in film and TV appearances. 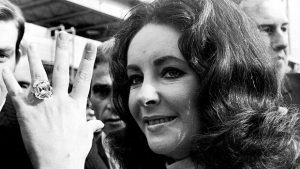 Upon her death, the diamond was renamed “The Elizabeth Taylor” diamond in recognition of her affection for the diamond. 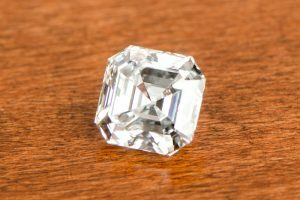 Despite the exposure that the Cullinan and Krupp/Taylor diamonds brought to the Asscher Cut, it remained a niche example within the diamond world. Part of this was because the Asscher Cut is designed not to twinkle and sparkle in the way that Brilliant Cut diamonds might, but to show the clarity and internal flawlessness of the original stone. This may have limited the appeal of the cut to all but the most discerning eye. Asscher cuts, although within the spectrum of emerald-cuts, will still cover various ratios while still retaining its name. The squareness of the Asscher cut is determined by the above ratio chart. The ratio is calculated by dividing the width by the length. For example, if the dimensions of the Asscher cut is 5mm x 5mm, the ratio is 1.0. If the dimensions of the diamond is 5mm x 5.2mm, the ratio is 1.04. Anything above a 1.08 ratio for a modern Asscher cut is considered a poor cut. Genuine antique Asscher-cuts are so rare that even a 1.10 ratio may still be sought after. The culet — the small point or facet at the bottom of a diamond — was added in the 14th century after the creation of the table cut. True antique Asscher cuts include a culet and a relatively small table. Given the culet and table requirements, authentic vintage Asscher cut engagement rings are very rare and difficult to procure. Their distinct appearance, especially the face-up, makes them a popular style for antique enthusiasts. This leads to a sparkling quality that contributes to its popularity among vintage engagement rings. Asscher cut engagement rings have experienced a resurgence alongside the public’s interest in antique and vintage jewelry. The dimensions of current Asscher cut diamonds vary drastically from stone to stone, but the simplicity and grace of this cut remain consistent across the board. The height of the crown and pavilion will always not be uniform, and their ratios will differ. 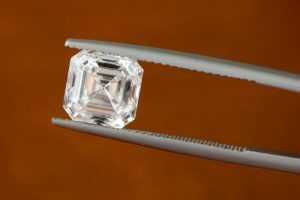 Unlike round diamonds, experts are divided on the optimal Asscher cut ratios, leaving the ultimate decision to the buyer. Informed buyers consistently choose Estate Diamond Jewelry because they recognize the commitment to quality that has defined our company. We employ third-generation jewelers who specialize in the exact same techniques that were prevalent in the Art Deco area. Our experts truly understand the craftsmanship of antique jewelry in a profound way that is unrivaled in the industry. If you demand the best of the best, there is no substitute for our breathtaking Asscher cut vintage engagement rings. Click here to view our Asscher Cut Collection.